Entities are the next step to take after adding an item and block to your game. We're going to be creating a cookie creeper that launches cookies everywhere when it explodes. Your IDE should instruct you to create a constructor matching the super– do that now. To register your entity, we'll use Registry.ENTITY_TYPE. To get the required registry instance, you can either use EntityType.Builder or FabricEntityTypeBuilder– we recommend using the second one. The size() method allows you to set the hitbox of your entity. A creeper is 1 block wide and 2 blocks tall, so we'll use (1, 2). If you load up your game at this point, you will be able to use /summon to see your creation. 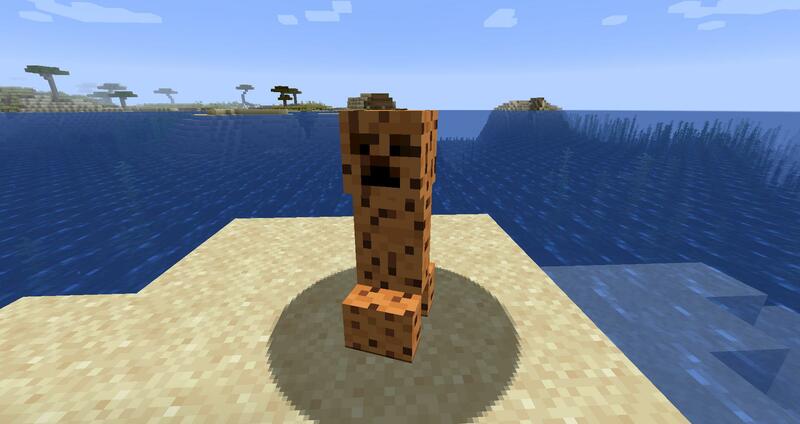 If all went right, it should appear as a normal creeper. I would not recommend going into survival. Our Cookie creeper automatically has a model because it extended the Creeper class. We're going to change the skin to a cookie skin instead of the normal green camo color. First, create a MobEntityRenderer class. MobEntityRenderer has 2 generic types: the entity & model. Because we're using the Creeper model to start, we'll also have to tell Creeper model this is not a Creeper Entity by giving it a type as well. For the getTexture method, you need to return your model's texture. If it is null, your entity will be invisible. This is a 100% guaranteed way to spend 3 hours trying to figure out why your model is not working. For your convenience, I have created a Cookie Creeper texture available to all, which you can download from here. with the file being stored at resources/assets/wiki-entity/textures/entity/cookie_creeper/creeper.png. If you wanted to use your own model, you could create a new class that extends EntityModel and exchange the Creeper model in our renderer for it. This is fairly complex and will be covered in a separate tutorial.